We’re lunching our new Teacher Feature campaign with a familiar face! Our founder, Rebecca Humphries shares her experience as a teacher and explains why she started Silly Fish Learning. I’ve been teaching a variety of subject for the last six years to students aged 2-25 years. As my background is in theatre, I’ve primarily worked as a drama teacher but have worked creativity into all of the subjects I’ve taught. I’m currently based in my hometown of Liverpool in the UK after ten years away developing my career. Prior to starting teaching officially I did quite a lot of volunteering with community groups and theatres with children and young people. In 2013 I was employed as an Artist Facilitator with Upper Space, offering interdisciplinary arts workshops (primarily craft and street art) in Pupil Referral Units in Manchester. Later that year I moved to Prague and started working as a TEFL teacher with adult students. In 2014 I was taken on by an agency and began offering TEFL classes in schools with student aged from 2-15 years. I returned to the UK later that year and started working in learning support and enrichment with additional needs students at Young Persons Opportunities Project where I had previously volunteered. I remained in the UK for around 10 months before being offered the position of Assistant Artistic Director of Prague Youth Theatre (PYT) and returning to Prague in August 2015. 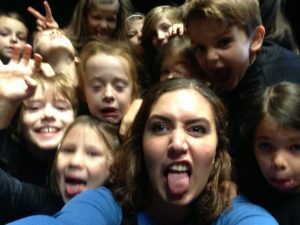 I stayed at the company until December 2017, teaching theatre classes full time to students aged 2-18 years. In addition to PYT, I worked as schools coordinator for Prague Fringe Festival, a drama teacher at the International Montessori School of Prague, a theatre judge for Excelsior Teen Fest, a facilitator for YES Theatre Camp and the British Council Summer School, and even fit in some time in the UK working for Speke Community Centre and the children’s charity, KIND…. phew! It was during my time at PYT that I noticed the lack of great creative resources and scripts for children. I started writing my own scripts and developing new techniques which received good reception. More and more people were asking me for scripts and advice so in June 2017 I started the Silly Fish Learning blog. After leaving Prague Youth Theatre I returned to the UK to put more time and attention into Silly Fish Learning and taking it further by registering the company as a children’s publishers (watch this space). While back in Liverpool I’ve done some part time drama teaching and returned to Speke Community Centre. I even managed a brief trip back to Prague to help PYT at the Class in Action theatre festival. I studied Acting at university but quickly realised that my passion truly lay in teaching and education. That said, I did do some acting and I must say that my all time greatest performance was as a cow in the PYT Tots Revue. It was not long after starting at PYT and our veteran Tots teacher asked for some support with her 3-5 year old class. Though I would go on to teach groups of this age, this was my first experience of trying to put on a show with very young students. Of course there were some hiccups but we arrived at show day feeling confident that we had a great play. Then disaster struck… one of our young actors didn’t turn up. Instead of panicking I volunteered to step in and had to swallow all of my pride and crawl around on stage in front of my friends, colleagues, parents and even some of our 17 year old students who were assisting. Not only did I have to crawl around like a cow, I also had to moo! To say it was embarrassing for me is an understatement! Of course the obvious lesson here is that the show must go on, but more than that I learned that you need to let go of all of your pride to be a preschool teacher. Especially as a drama teacher, if I want my students to express themselves I have to be prepared to lead by example. In the drama classroom, virtually everything I do is creative. I think what I try to encourage is my students’ creativity. As much as possible I allow them to be the decision makers: I try to always ask my students what they think we should do with a scene and what they think we need to improve and how we can do that. I even let them set their own rules. Of course I know that they’re still children so I often have to make sense of a slightly oddball idea. In this way I understand why drama teachers are often called facilitators… I facilitate their ideas and help guide them through the process, but their ideas are still their own. I prefer a collaborative learning experience that helps my students to be creative, independent and assertive. I much prefer seeing the students take ownership of their work than parroting my ideas. The most important thing is to keep learning. Do everything you can to be a better teacher. The more you know the more you can teach to your students. If you’d like to be a featured teacher you can apply here! Kid’s Craft – Four Leaf Clover for St Patrick’s Day!